Over recent years engineered oak flooring has become highly popular and sought after as an internal flooring solution. This popularity can be attributed to the numerous benefits which it provides homeowners. At Oak Floors Online we are often asked about what benefits engineered oak flooring can provide our customers. In order to answer these questions in both depth and detail we decided to provide this informative article. It supplies the same stunning aesthetics which are typically associated with solid oak flooring panels and planks. Initially when this type of flooring was introduced to the market it was considered to be the poor man’s oak flooring. However this is no longer the case as good quality engineered oak flooring provides the same stunning aesthetics as solid oak flooring. Engineered oak flooring does not expand and contract with the same frequency as solid wood flooring. This is the primary advantage which engineered flooring has over solid flooring. This can be attributed to the clever construction techniques which are used to manufacture engineered oak flooring. This means that engineered oak flooring is perfectly suited for use in environments where solid oak flooring may become damaged. It can be laid in kitchen and bathroom environments where there are fluctuating temperature and moisture levels. This type of flooring is extremely durable. This is again due to the manufacture process used to create it. As part of this process each individual engineered oak flooring plank is comprised of multiple layers of plywood which are bonded together before a solid oak top layer is added. Engineered oak flooring is easier to install than solid oak flooring. The planks lend themselves perfectly to both DIY and professional installation. This is because as part of the manufacture process. Our boards are accurately machined specifically to provide fast and simple fitting. 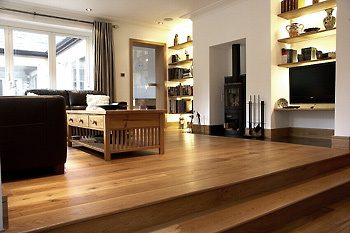 Engineered oak flooring provides the possibility of much wider flooring planks. With solid oak planks, or solid planks from any timber variety, in order to produce wider planks requires locating a wide tree. This isn’t so with engineered oak planks, as the core of the plank is constructed from plywood the planks can be constructed much wider without incurring a massive costs. With a two or three strip engineered board you will be easily able to install your floor with fewer visible joints on the surface.